Magnolias are well into bloom here at UBC Botanical Garden. I did make the prediction in the entry on Iris unguicularis a month ago that “it may be one of those years where the first magnolias blossom in early March, if not late February”. One might argue I was too conservative, as the first blossoms opened prior to February 20. In any case, the Garden launches its seasonal opening tomorrow, for what will be both a beautiful and busy day. I chose today’s image for its illustration of how cameras capture colours, and why it isn’t always useful to rely on photographs if one wants to know the “true” colour of an object. It’s a contemporaneous subject, as there seems to have been much debate about a dress the past couple days: “The Science of Why No One Agrees on the Color of This Dress” (via Wired). In today’s photograph, those parts of the unfurling flower in shadow have a bluish-cast, including not only the tepals but also the fuzzy hairs on the distant perules (or bud scales). Those parts exposed directly to the rays of the sun have a daytime “white” light to them, which is most noticeable on the forefront line of those fuzzy hairs, though some tepals have a bit of daytime light on them as well. To make matters more confusing, some of the tepals are side-lit so that they are glowing with the light that has diffused through the tepal. For another photograph of a flower from this particular plant, this time in late-evening golden light, see this previous entry on ‘Eric Savill’ magnolia. Different lighting conditions, different colours. For scientific photographs and scans, colour calibration charts or cards are often inserted into the images to permit later correction to standard colours under standard conditions. For example, see this specimen of Corydalis aurea from the UBC Herbarium, but do note that while the colour calibration chart is present, the image is not yet calibrated–e.g., the black in the chart is not a true black. For more on Magnolia sprengeri ‘Eric Savill’, either read the linked entry above or see the RHS page on the cultivar: Magnolia sprengeri ‘Eric Savill’. The RHS site contains yet another photograph with a different rendition of blossom colour (I’d guess a scanned slide of a flower photographed indoors under a mix of indoor lights). Something I don’t see mentioned at linked to discussions is that tepals opening rumpled is typical of this cultivar. I see this as a spoiling defect, making many of the flowers look as though they had been damaged in the bud stage. Lovely pair of photos…while I look out the window at a persisting 12 to 18 inches of snow covering the ground, bare trees, etc., it’s good to learn that somebody somewhere is seeing light and color and flowering plants! “Illuminating” description ! I’m not an artist or serious photographer, but love to be aware of light falling on surfaces and textures. These short paragraphs help me see more. Thank you. The photo from that previous entry (a month later in 2011) is also stunning. Interesting writeup about colour perception, and I liked the link for the dress colour article better than what I read two days ago. 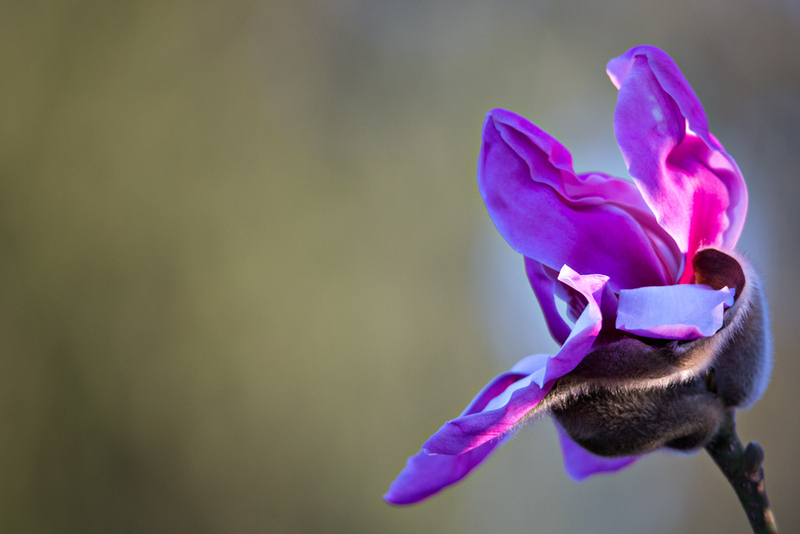 Crumpled tepals just add to the beauty of Magnolia blooms and the colours of your photo are exquisite. Would that it’d go viral too. Thanks for this. Magnolia has these early flowers and I have been looking at palm flowers, the males flowers many stamens the females with no petals, just the calyx and ovary. The monocots diverged very early.